Yakiniku (焼肉) is Japanese Grilled Meat. It is seasoned strong to eat with rice, so you can add some more meat or vegetables if you prefer. 1. Cut the beef into bite-size pieces if necessary, and season with Yakiniku Sauce. *you don't have to soak but cook immediately. 2. 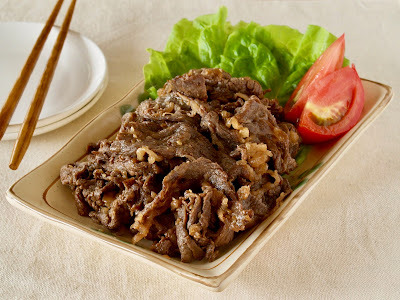 Cook the seasoned beef in a frying pan until done. 3. Serve with lettuce and tomato if you like.